Great News! An endangered Millerbird chick has fledged – left the nest and is now flying on its own – on Hawai‘i’s Laysan Island for the first time in nearly 100 years. This conservation milestone has conservationists clapping. Not all attempts to save species or bolster populations are successful, which makes this event following the recent historic reintroduction of the rare songbird to the island something to celebrate. Only about 775 Millerbirds remain in existence. Until recently, all were confined to Nihoa Island, where they risked extinction from the potential for introduced predators, hurricanes, or other extreme events. 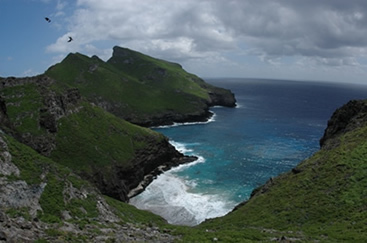 In September 2011, 24 of the tiny songbirds were caught on Nihoa and released on Laysan Island, 650 miles away, in an effort to create a second population of Millerbirds and minimize the risk of extinction. Millerbirds historically occurred on Laysan but were wiped out sometime before 1923: a result of the devastation of the island’s vegetation by rabbits and other introduced grazing mammals. The U.S. Fish and Wildlife Service (FWS) and American Bird Conservancy (ABC) joined forces to orchestrate the reintroduction, which took many years of research and planning by biologists and resource managers. Both Laysan and Nihoa Islands are within the Hawaiian Islands National Wildlife Refuge and Papahānaumokuākea Marine National Monument. Shortly after the Millerbirds arrived on Laysan last fall, they made several unsuccessful, out-of-season breeding attempts. But, now the birds are in their first proper breeding season, and it has resulted in this exciting news. Nest building activity was first observed on Valentine’s Day. 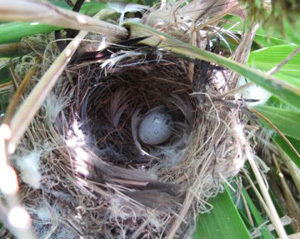 The first complete nest of the season was discovered the last week of February, and the first eggs on March 8. Since then, birds from a total of eight pairs have been seen carrying nest material, building nests, or exhibiting other breeding behavior. On March 19, two pairs were incubating eggs, and one pair was feeding a nestling – which has just now fledged. The chick is active and alert, and both parents have been observed feeding it. Because of the difficulty of accessing Nihoa, this breeding on Laysan is also the first opportunity to observe Millerbird reproduction from start to finish and collect behavioral and life-history data at all stages, marking a significant advance in the study of this endangered species. “This is another huge milestone in the effort to save the Millerbird from extinction. We still have a long way to go, but each victory like this is encouraging, and tells us that, so far, we, and the Millerbirds, are succeeding,” said George Wallace, ABC’s Vice President for Oceans and Islands. “The early success of the Millerbird Translocation is very encouraging and we hope this first fledgling will be one of many Millerbirds to hatch and successfully reproduce on Laysan Island – bringing the species that much closer to recovery,” said Jeff Newman, acting field supervisor for the Pacific Islands Fish and Wildlife Office. At least 21 of the 24 translocated birds survived the winter storm season on Laysan. Three of the birds have not been seen for more than four months, but other “missing” birds have made dramatic reappearances after absences as long as 112 days, so it may be premature to assume that any of the birds have been lost. If they are not singing, Millerbirds can be mouse-like and stay hidden in dense vegetation, making them hard to find. The new biologist had just arrived in time for this historic event, and will monitor the birds through the spring and summer. The goals of the monitoring are to track each of the Millerbirds to determine their survival through the spring and summer, their breeding success, and the progress of any chicks that hatch. Ultimately, the monitoring biologists hope to see the first generation of birds hatched on Laysan begin breeding on their own. At over 1,025 acres, Laysan is much larger than 155-acre Nihoa. Although the Millerbirds have mostly remained in the area surrounding the release site in the northern portion of the island, two birds have made treks to the far southern end of the island, nearly a mile away. One bird has made the round trip several times! The Millerbird, which weighs less than an ounce, is a lively, brown songbird that forages for insects among low shrubs and bunch-grasses. 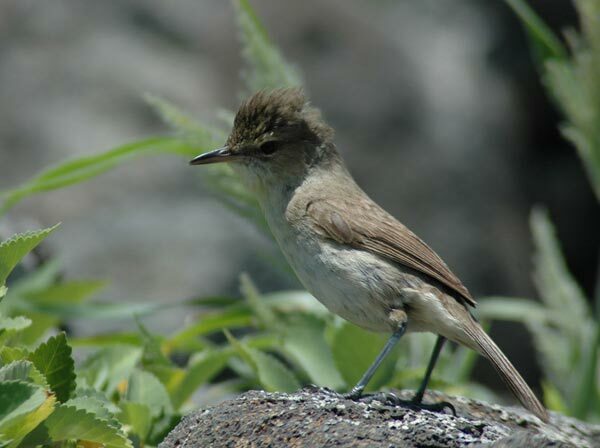 On Laysan, the Millerbird joins other endangered species, such as the Laysan Finch, Laysan Duck, Hawaiian monk seal, and several plant species, as well as millions of nesting seabirds.